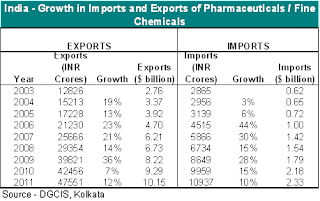 Pharma and Fine chemical exports and Imports from India have grown at 18% CAGR from 2003 to 2011. In 2011, pharma and chemical worth $10b were exported, as compared to $2.8billion in 2003. 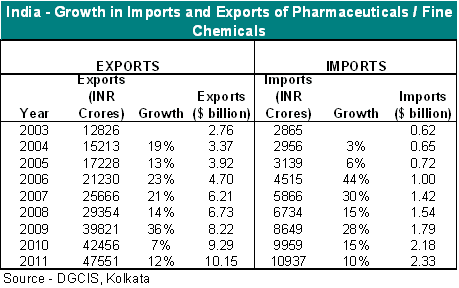 In 2011, pharma and medicinal exports comprised 4.2% of the total exports from India. Imports have grown at the same rate as exports. In 2011, pharma and fine chemical worth $2.33b were imported. Pharma and medicinal imports comprise 0.64% of National imports (2011).